Miles Hilton-Barber is a Blind Adventurer and Inspirational Motivational Speaker. Miles has been blind for just over thirty years, but has not let that stop him from challenging barriers, seeking adventure and succeeding on expeditions to deserts, mountains and the polar regions. He is an exceptional storyteller and corporate motivational speaker whose messages of ‘never give up’, ‘expect the unexpected’ and ‘think big to achieve big’ come wrapped in a package of humour and profound personal insight. 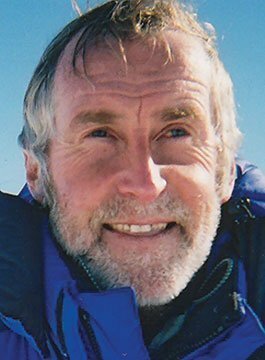 Miles Hilton-Barber uses his experiences as an international adventurer to motivate and inspire others to achieve their potential. His words are not hollow generalisations – he offers practical ideas that work for everyone. Miles’ managerial background complements his skill as a speaker, enabling him to tailor his talks to your particular business and personnel. Miles’ motivational presentations challenge his audience to think of the message in terms of themselves and how they can reach their full potential. Miles’ messages have come from the challenge of expedition organisation and fighting against the odds to complete each one. The motivational techniques that he has learnt through adventuring are shared via his humorous and profound style. He creates an atmosphere in which people motivate themselves – the most effective way of ensuring that your team will stay motivated for months and years after the talk. His principles are universal, simple and easy to put into practice – this is why they will work for anyone, both in business and in their everyday lives. First blind pilot to undertake a 55-day, 21,000 kilometre microlight flight from London to Sydney, relying on revolutionary speech-output technology, accompanied by his sighted co-pilot. Man-hauling a sledge over 250 miles across Antarctica. Climbing to 17,500 feet in the Himalayas. Climbing Mt Kilimanjaro and Mt. Blanc- Africa’s/Europe’s highest mountains. Running the 11-day Ultra-Marathon race across China from the Gobi Desert to the Great Wall. Completing the “Coldest Marathon on Earth”- the Siberian Ice Marathon. Competing in the hottest ultra-marathon on earth across Death Valley California. Crossing the entire Qatar Desert non-stop day/night in 78 hours without sleep. Circumnavigating 38,000 miles around the world using 80 different forms of transport. Setting a new British high-altitude record for a tandem microlight (20,300 feet) with -55 Centigrade open-cockpit temperatures. White-water rafting down the Zambezi River. Completing more than 40 skydiving jumps. Cage-diving with Great White Sharks. Becoming the first blind person to do the solo kamikaze skeleton run down the 5G Olympic bob-sleigh track in Lillehammer, Norway. First blind person to drive a 340 BHP performance rated Zap Cat power boat in ocean time trials. First blind pilot to undertake a sortie of extreme aerobatics in a +600 MPH Hawker Hunter fighter jet with an ex-Red Arrows co-pilot. Miles Hilton-Barber has shared the speaking platform with such individuals as Rudi Giuliani, New York Mayor on 9/11, Olympic Medallist Roger Black, Jeremy Paxman, Melvin Bragg, and Lord David Puttnam addressing corporate and celebrity audiences around the world. Dream Big to Achieve Big. “Having spent many years in darkness during my incarceration in the Middle East, I have some small understanding of what it is to experience sight loss. It is therefore with great admiration that I give my support to Miles. He brings encouragement not only to the visually-impaired, but to thousands of others throughout the world." "Miles Hilton Barber does what he does to inspire others. If he can take on the walk to the South Pole, then a grandmother who is losing her sight might just feel able to take on the walk to the local Post Office. I've never met anyone whose courage is being used to such great effect"
“I can't even imagine the difficulties of travelling in Polar Regions without being able to see things. My admiration for Miles is enormous..."
"Miles Hilton Barber has a wonderfully inspiring attitude to life. His simple 'life rules' make living a more rewarding experience, and help you to focus on the important things in life that can make a real difference."